Lures, lures and more lures! There are so many to choose from, and each manufacturer has there own versions, often very similar to others. Some lures are as effective today as when they were introduced decades ago, and every once in a while a new lure comes out that doesn’t just catch my eye because I’m itching to get out on the water, but because it really does have the potential to be really unique and effective. When the Scatter Rap was introduced a couple years ago, I was immediately intrigued by the potential. 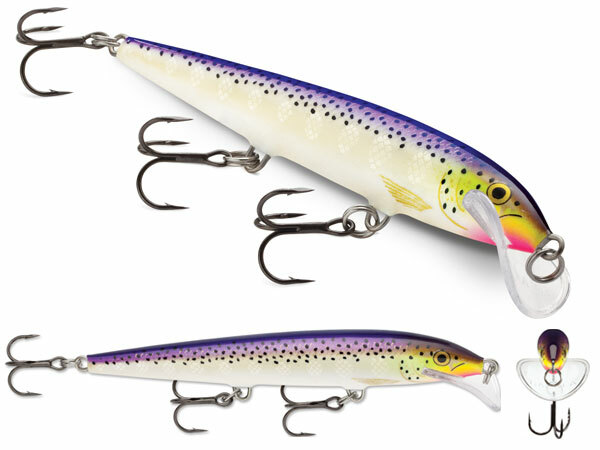 A lure that would dart from side to side, in addition to the traditional wabble that Rapala is known for. The idea that I could get dramatic changes in action simply by speeding the lure up and down. All of the promos made it look amazing (as they should from a marketing standpoint), but the proof would be on the water. When I got my hands on my first few minnow and shad bodies, I was excited to try them out. It’s now been two years, and I’ve been using the Scatter Rap on most of my fishing adventures. Each time I use them they produce fish, and usually some of my better catches! So for that reason, I love them. They are great for when I’m trolling, where I can move my rod forward and back to change the speed, or I can speed the boat up or down, or just allow my trolling patterns to effect the action as I turn corners or use a zig zag pattern. On my last few fly in trips, the Scatter Rap Minnow has accounted for some of my better fish, while the lures lasted that is. And that’s what brings us to the “hate” part? Well here goes. Where as most all of my other Rapala products are durable, taking a beating from fish, rocks etc, the Scatter Rap is not. The lip, the key feature on the lure that gives the action, is glued into the body and will literally fall out when put under duress. Now, I’m not talking heavy duress, I mean snapping it through a weed, bouncing it off a log, or heavens, having it smashed by a hungry Pike. I’ve now blown the lip out of over a dozen lures. The first 4 I sent back, filling out forms, removing the hooks and mailing them back, but they came with a letter saying no further replacements. The effort alone would deter you from returning them. After 2 and a half years I continue to use them, but I have to say after I spent another $40 replacing three blown lips after my last trip, the “hate” may surpass the “love” soon. I have to believe that I’m not the only angler who has experienced this, and it’s my hope that they find a way to maintain the key lip feature, but find a way to make it more durable because it has been an amazing lure to use. UPDATE: If anyone knows a Rapala Rep, I’d be happy to discuss with them. Not trying to badmouth Rapala, if you saw my gear it couldn’t be further from the truth! This entry was posted in Equipment / Gear, Fishing, General and tagged amateur, Angler, bass, crankbaits, fishing, Fly In, jerkbait, lures, Rapala, Scatter Rap, trolling, Walleye. Bookmark the permalink.